If you missed out on the preorder bonuses for Kane & Lynch 2: Dog Days, fret not! Square Enix is more than happy to sell them to you as part of three packs of downloadable content going on sale today. 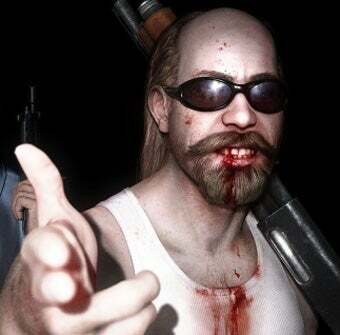 All in all, Square Enix is releasing $11 worth of Kane & Lynch 2 downloadable content today between the Doggie Bag, Alliance Weapons, and Multiplayer Masks packs. The Doggie Bag pack, which will set you back 560 Microsoft points or $5.99, consists of two brand new multiplayer maps, Dockyard and High Rise, plus the previously preorder-only Radio Tower map, along with five new weapons: the DD 33, KL Viper, RTS, SMi 69, and the TOQ Model Four S.
The Alliance Weapons pack packages seven preorder weapons into one $2.99/240 Microsoft point pack. The pack includes the Doretta Silenced, Steele 870, TOQ SBR, Kaliningrad 47, PAC 10 silenced, N 77P Silenced, and the TOQ Elite. Or for $1.99 or 160 Microsoft points you can pick up a set of eight multiplayer masks, which were also a preorder bonus. Square Enix sure loves to nickel and dime the downloadable content, doesn't it?